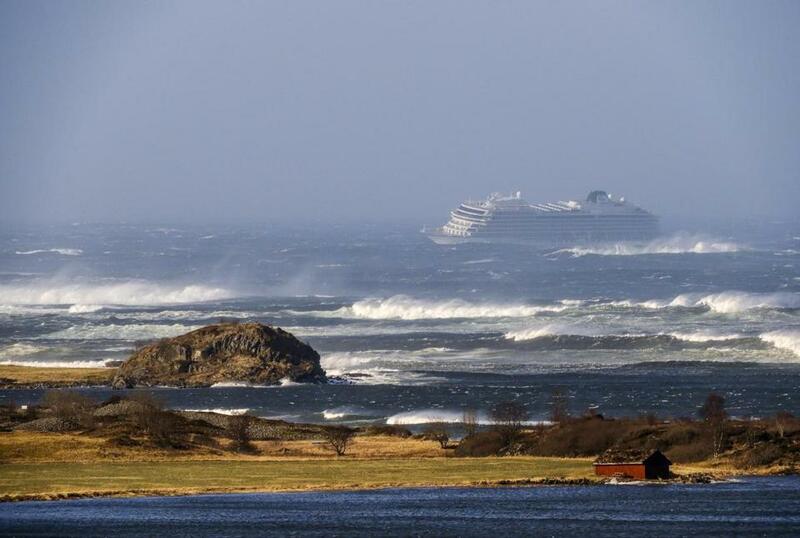 The Viking Sky was adrift off Norway before dropping anchor in Hustadvika Bay. HELSINKI — A cruise ship with engine problems sent a mayday call off Norway’s western coast on Saturday, then began evacuating its 1,300 passengers and crew amid stormy seas and heavy winds in a high-risk helicopter rescue operation. The Norwegian newspaper VG said the Viking Sky cruise ship ran into propulsion problems as bad weather hit Norway’s coastal regions on Saturday and started drifting toward land. Police in the western county of Moere og Romsdal said the ship’s crew, fearing it would run aground, managed to drop anchor in Hustadvika Bay, between the western Norwegian cities of Alesund and Trondheim, so the evacuations could take place. Rescue teams with helicopters and boats were sent to evacuate the cruise ship under extremely difficult circumstances.